Gulnaz Mamytbekova. Photo courtesy of the author. All rights reserved. Last Saturday, Gulnaz Mamytbekova, a nurse in the intensive care unit of her town’s children’s hospital was getting ready to move to Moscow. Everywhere Mamytbekova went, her daughter went with her. After 25 years working at the hospital, Mamytbekova wants to emigrate so she can earn enough money to give her children a “better life”. Gulnaz lives at her parents’ apartment 60km from Bishkek, the capital of Kyrgyzstan. She is divorced and is bringing her children up on her own. Her day begins at 4am: “I’ve never once been late for work. Four hours of sleep is enough for an active life,” she says. At a quarter to six, she’s already at the bus stop, waiting to go to work. She hasn’t been able to save enough to buy her own flat: her monthly pay packet, including all the extras comes to 13,400 som (£136). Gulnaz recalls the reason she couldn’t receive any higher education. Back in 1993 and already a nurse, Gulnaz wanted to get into a medical institute, but says that the examiners were demanding a 7,000 som bribe. “You could buy a flat for that amount then. We couldn’t give them a bribe like that. And I decided to become an indispensable nurse instead,” she tells me, clearly proud of her decision. In Kyrgyzstan, higher education is more or less an essential, although few graduates actually find work in their field of study. People often joke that you only need a degree so that you can show off to your family, and so that they can say that their son or daughter has been to university. Mamytbekova graduated in nursing, with the highest grade, from a secondary level medical college and got a job as a lab technician, although she actually spent her time cleaning the floors in a children’s emergency department. Mamytbekova believes that she was born to save and care for children. She has no thoughts about earning a high salary or having a plush life. She is going to Moscow for two years with the aim of saving enough money to buy a flat and giving her children an education, and then she’ll come back home and go on working in the children’s emergency department. There is a popular myth that only men can work in stressful conditions – women are supposedly too emotional. But listening to Mamytbekova’s story, you can certainly imagine the difficulties she has had to face, not to mention her life on low pay. Kyrgyzstan currently publishes no data on gender statistics, what occupations the majority of women work in. But Mamytbekova has hardly seen any male nurses and believes that most lower paid medical posts are occupied by women. Asel Ashirbayeva. Photo courtesy of the author. All rights reserved. Kyrgyzstan’s most recent gender statistics reveal that the Central Asian country has 30.4% fewer women than men in its civil service, although there are now 10% more than 15 years ago. And as well as this slight increase in female civil servants, women’s pay in general has also gone up, although it is still much lower than men’s. In 2002, women earned 35.1% less than men; by 2016 they had gained only 10.4% in relative terms. The average monthly income is 14,912 som (£151), with a minimum living wage of 4,794 (£49) per head of population. 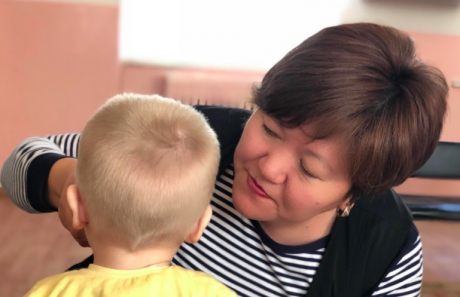 Not everyone can work with children: according to Ashirbayeva, a nursery teacher has to be not only emotionally well-adjusted, but have nerves of steel (when bathing 18 children daily, for example). The children’s home houses up to 75 youngsters, from newborn babies to four-year olds. Many of them have been removed from their parents by social services, mainly because of dire poverty or alcoholism. Statistics tell us that in 2016, 25.4% of families were living in poverty, and 31.5% of children aged 0-17 were being brought up in poverty. There were 2311 children living outside a parental home. Ashirbayeva lives outside Bishkek and wakes up at 5am to milk her cows before setting out for work. She has no children of her own yet – she is completely absorbed in her work. Almost every infant arriving in the home has developmental delay of approximately one month, she tells me: “A three-month old baby, for example, should be reacting to different coloured toys, and a four-month old should be able to hold a toy in their hand. 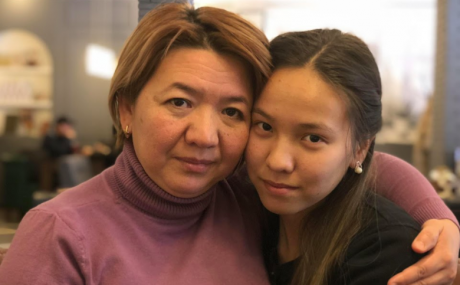 It’s crucial not to miss these milestones.” It’s harder to work with children removed from their parents, Ashirbayeva says. They have to get used to bottle feeding. One nurse cares for three children in a shift, and it can be a problem to work out a timetable to ensure that each child gets the right amount of food and sleep. 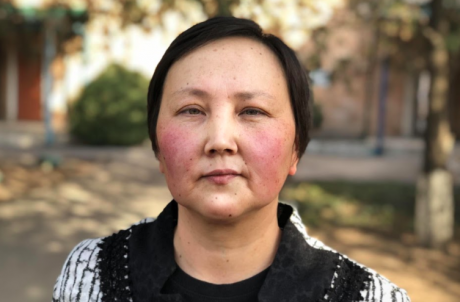 Ashirbayeva, like her colleagues, doesn’t wear a uniform – her managers feel that this gives the centre a more homely atmosphere. She can’t, however wear earrings, gold rings or other jewellery. She earns £153 a month, which she is happy with: she says that she has enough for all her needs – transport, food and other minimal outlays: “If you are not the breadwinner in the family, you have more than enough for yourself,” she tells me. Three years ago, Dinara Mambetaliyeva joined the staff of a children’s home. A trained teacher, she had spent many years working in the commercial sector, but exchanged her good salary for “a job where I’d be more needed”. Work like this is very badly paid – Mambetaliyeva couldn’t make ends meet on her own, but her own children have a comfortable life thanks to her husband’s salary, so she’s not fussed about her own pay. Dinara Mambetaliyeva. Photo courtesy of the author. All rights reserved. Mambetaliyeva cares for children from one to three years old. “The teachers who come here are devoted to their profession,” she says. “My work isn’t easy, as I have to constantly watch my own behaviour – the children mustn’t feel any jealousy towards one another or feel that someone else gets more smiles.” During our conversation, several children come over to her for hugs; some don’t want to let go of her at all, but she gets round the problem by throwing balls in various directions to distract them.